The Area’s Best DJ’s Will Make Your Party Amazing! Your DJ is your most important vendor at any party! 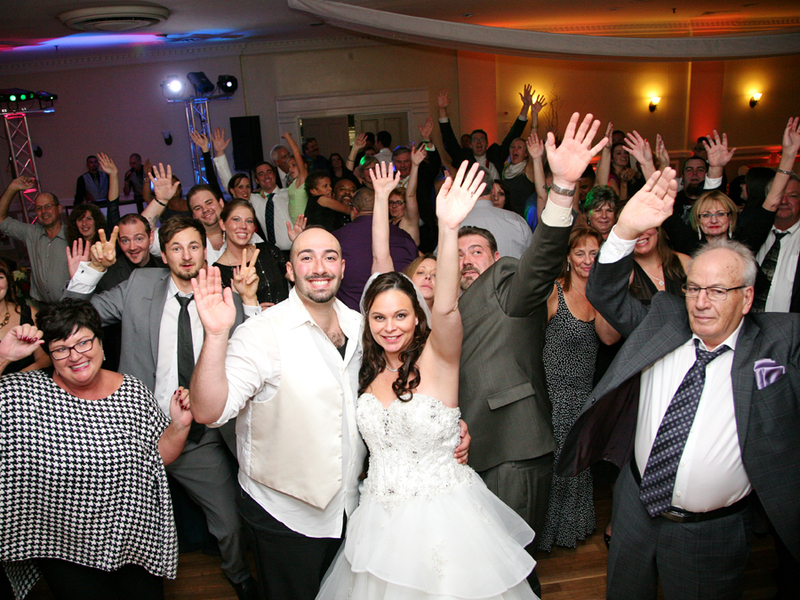 Our DJ’s will make your reception fun and exciting, exactly what you envision! The right DJ sets the tone for the evening and can make your wedding reception one to remember for a lifetime. 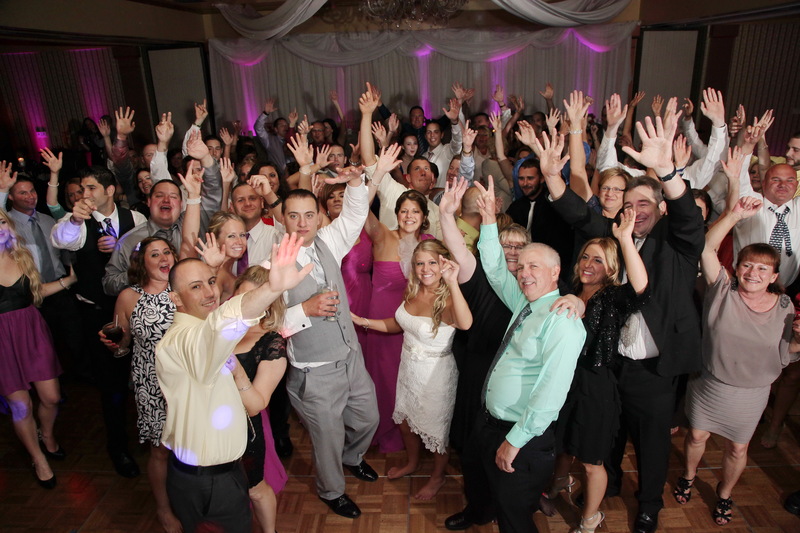 We are Wedding DJ’s in Scranton, Wilkes Barre, Allentown, the Poconos, Lehigh Valley, Hazleton, and all of Northeastern Pennsylvania. Enjoy the best of today’s music on our high fidelity sound systems! Your DJ will play the right blend of current dance, rock, disco, 80’s, hip-hop, and oldies to keep your guests dancing all night long! Your DJ will arrive at your reception with over 25,000 songs. Your guests can make requests of your favorite music throughout the evening and your DJ will be able to deliver. Our DJ’s separate themselves from the competition with their personalities. They will keep your wedding reception exciting all night long as they play your favorite music, announce the bridal party entrance, first dance, parent dances, and whatever traditions you choose. We will tailor the music to your specific tastes and help create an atmosphere that fits your wedding style perfectly. Browse our song list below to view the songs that are carried to each party. Special requests are no problem. We own over 1 million song selections in our Clarks Summit studio and have access to millions more. 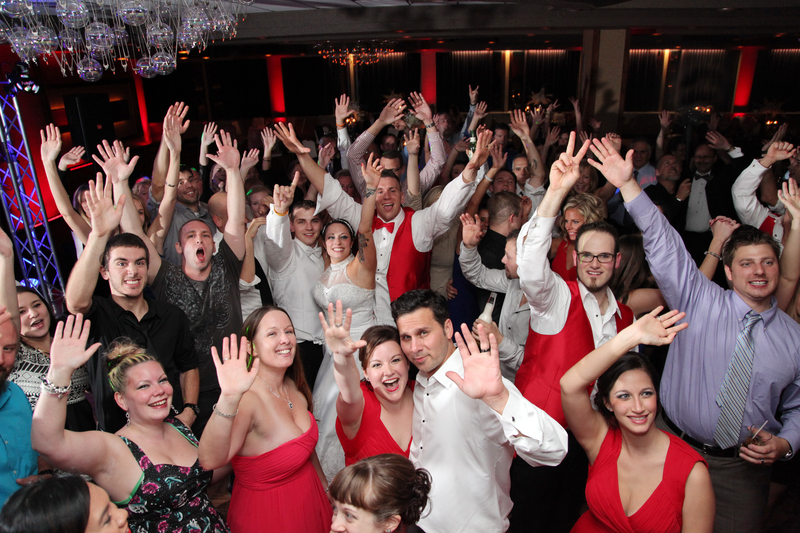 Email or call us today to make an appointment to hire our Wedding DJ entertainment for your special day 570-587-2740! A DJ that will leave your guests talking about how great your party was for years to come. Our DJ’s are trained to read your crowd and play the right song at the right time. They also act as your MC, making necessary announcements and controlling the flow of your evening. Can I Pick My Own DJ? We will honor any special request for a specific DJ IF he/she has not already been requested. If the DJ is a team leader, he/she must remain available for team jobs. If a team job isn’t booked by the week of your reception, that DJ then will go to the reception that requested him/her first. No matter which DJ you get, you are going to have a DJ that has been trained in the art of reading your guests and motivating them with a selection of the most recognizable music around. Our disc jockeys and entertainers standard dress code is Tuxedo. If you do not require a tux, our DJ will then dress accordingly to your reception / party. Whether they be in suit & tie, dress casual or casual, our DJ’s exhibit professional taste. No! Our DJs spin non-stop music from the arrival of the first guest to the last song of the night. If a restroom break is needed, they will take it during a long song, but only if absolutely necessary. How will your DJ interact with my guests? Our DJs are trained to speak to your guests only when necessary. We are not the wedding DJ’s that talk way too much. We get your guests involved in the song. Whether it’s with a specific dance, having them sing a chorus or just having them clap along. Our sole purpose is to get the party started and keep it going, NEVER in an obnoxious or obtrusive way. What if a song we want to hear is not on your list? We take your requests weeks before your wedding and make sure our DJ’s are equipped with any song we do not carry already. With the technology today, our DJ’s can also pull special requests the day of your event if necessary. Do your DJs honor requests? ONLY if you would like us to. We can also regulate what types of music can or can’t be played. The Music Machine DJ’s are the most flexible when it comes to your music. Will your DJ drink any alcohol at my reception? ABSOLUTELY NOT! This is a very strict guideline with Frankie Carll Productions. 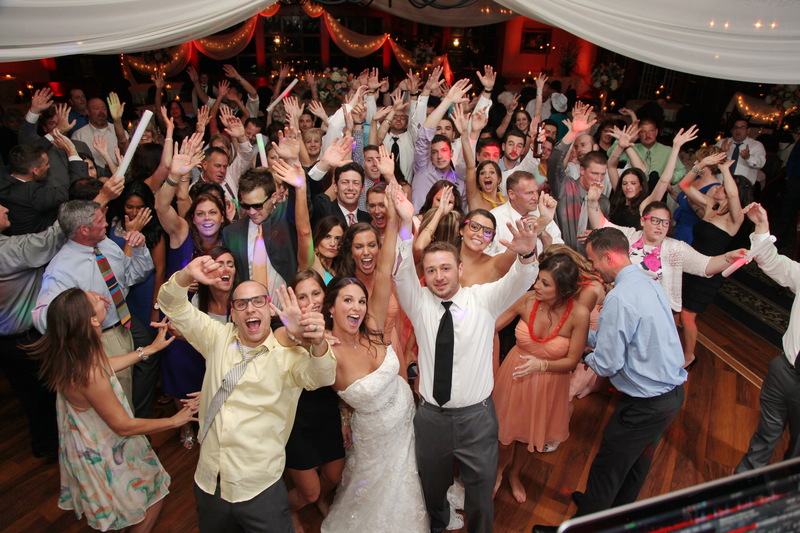 Our DJ’s are there to do a job that requires maximum concentration and utmost professionalism. Alcohol does not fit into that equation. Do your DJs smoke behind the DJ booth? NO! Another strict guideline with our DJs. Of the many we employ, there are 1 or 2 that do have a smoking habit. They have been instructed to do so before or after the reception – NOT DURING. Tips are never solicited, required or expected. There are some that would say that it is etiquette to tip all of your hired services. However, in today’s economy, we realize that it is not always possible. We charge a reasonable amount for our service and pay our DJs well. They are paid to do a great job for you. However, if you feel that your DJ went above and beyond the call of duty, did an outstanding job and you have the means & desire to give them a tip, it would be greatly appreciated and absolutely accepted. We were at a wedding once where the DJ sang to everybody during dinner. Do your DJs do that? No. DJs play prerecorded music and are not supposed to sing. The last reception we were at the DJ was so loud during cocktail hour that we could even speak to friends and family. Is there anyway our DJ can play quiet at these times? Our DJs are trained to play cocktail and dinner music at a level that is pleasing to your guests, so that they can enjoy good music and conversation as well. They are instructed that if they cannot hear a murmur of voices from your guests, they are too loud. Can I speak with the DJ before the reception? There are companies that would say you need to do this and that if you cannot, the company you are working with isn’t legitimate or sub-contracts out to the cheapest available DJ on your date. That could not be further from the truth. Frankie Carll Productions has been in business for over 30 years. We pride ourselves in delivering quality entertainers to any occasion. The DJs that we employ work for our company only and with our equipment. We own and operate ten DJ systems. The professionals you see on our “Meet the DJ” page and in our DJ Video have been professional jocks for years. Not one of them regards this as a fly-by-night, part time fling. Each one respects the fact that this is someone’s once in a lifetime event. Now even though Frankie Carll Productions is a full time operation, employing over 15 people total, the DJs we employ have full time careers in other fields. This does not allow them the time between work and family to meet all of the clients whom they will work for in the field. The office staff at Frankie Carll Productions consists of the owners and the head of the DJ department. They work through all of your details and relay them thoroughly to your DJ. We guarantee that no matter which DJ you have, you WILL be serviced by a professional DJ from the area’s most elite entertainment service. Yes. Every DJ carries spare equipment with them and has access to our shop where we have literally hundreds of pieces of backup equipment available. We have contingency numbers to call in an emergency and perform regular maintenance and upkeep on our systems. While we have 10 systems available on any given day, we only book nine so that we have a person to turn to in the event of a crisis. How much in advance should I book a DJ? We are often booking dates up to 2 years in advance. The better the company, the more in demand they are. Several dates a year (usually in May, September, and October) sell out very quickly because they are optimum dates. You should consider booking a DJ from Frankie Carll Productions no less then 12 months in advance. However, because we have 10 systems available, we often times have availability when other companies do not. This means that even some of the most popular dates may still be available with us. We carry the maximum allowable insurance for liability allowed. Several catering halls now require this of performers before they can play at a function. We are fully insured to $1,000,000. Frankie Carll Productions’ sole business is entertainment and video. We live and work to make each and every job we do a success, not only for us, but also for our clients. Our office is open daily during the week to answer your questions and assist our clients. We are a full time operation whose sole purpose is to serve you. Is set up additional charge? No. Even though our DJs arrive at a party approximately an hour before, we incur the cost of set up in our price. No additional fees will be added. Do your DJ’s get the party moving? What do you mean by reading a crowd? Reading a crowd is nothing more than judging the eras or genres of music that they will enjoy. We do this first by simply looking at your guests as a whole to see what age groups are represented. After doing this, we go through a variety of music to see what works the best for your particular party. This doesn’t mean that that’s all you’ll hear the rest of the night, but if it works, we’ll use a lot more of it. Request to have a DVD sample sent right to your doorstep. View wedding photography, video, and DJ samples in the convenience of your own home. Take your time, show friends and family, and make the decision that’s right for you. Request Now!